What is everyones take on our linebacker situation this year? I would like to see us try Lehman at MLB and move either Davis or Lewis to the outside positon. If Boss is anything like his brother, and can get healthy, he's going to be a BEAST!!! The big question though is.......can Lehman improve his skills??? He had a very difficult time shaking blockers last season. "win if you can, lose if you must, but ALWAYS cheat"
I feel that linebacker is possibly the greatest strength on the defense, and has the best overall depth on this team. Lehman will likely make the switch to the weakside position rather than to middle. Reason? Holmes had a great year and still has a year left on his contract. Plus, as you stated, Lehman has trouble shedding blockers. That was the big drawback for him in college. With his speed Teddy is best suited to playing in space, and the Lions now realize that is the best spot to put him to take advantage of his athleticism. Lewis will likely backup Lehman weakside, Bailey starts strong side and Curry backs him up. Davis will backup Holmes in the middle. Nickel package will likely have Davis and Lehman at linebackers, while the dime package will have either Lewis or Davis as the sole LB. Boss showed in 2003 that he can be an outstanding player in this league. Lehman showed last year he is a fine player as well. The outside of the linebacking corps on the Lions is STRONG, with starters and quality depth. HALLELUJAH!! Now if we can only apply that to the secondary and offensive side of the ball. See Mike, I think that Lehman would be best on the outside, and it would give us the most talent on the field at linebacker with Bailey-Holmes-Lehman, but I truly feel that the organization drafted Lehman to play middle. I would not be surprised to see us either draft a ILB or a OLB, even though we have numerous players under contract at those positions, that are talented, because 1) Millen loves taking linebackers, and 2) We don't have a ILB for 2006. I agree that the trio you mention is the best players for our linebackers. I also agree that the Lions drafted Lehman with the intent of having him in the middle. However, I believe they've given up on that idea for now. Holmes proved he's a valuable commodity and will most likely be the starter at 'Mike' barring injury or a drafted replacement. I actually don't think the linebackers are that strong. While it's not as glaring a problem as the safety position, it's still a mediocre group. Holmes played well, but not anything beyond average. Lehman played solidly, but made no big plays and did not shed blocks that well as people have mentioned-- he did show a good ability to run people down and tackle well one on one. Bailey of course is our best linebacker and was out, but honestly we really don't know if his knee problems are going to continue because of his surgeries during college -- he'll probably come back, but the fact that he took so long to heal was not a good sign. Davis was pretty damn poor in relief and too little has been said about how weakly he played. Lewis showed a few things, but he, like Davis, is an undersized fifth rounder. I appreciate people saying that Holmes/Lehman/Bailey is a decent group, but I think our depth is not nearly as good as people suggested, and I think we need a more physical playmaking guy in the group. If the right guy as available in free agency or high up in the draft, I would take him, because I'm still a little worried about Bailey and because Holmes needs to be upgraded. Adding a strong safety who is well versed in run support will make our linebackers look better. I agree with Brian that Bailey-Holmes-Lehman is the best combo of the players currently on the roster. Actually I was impressed with Lewis last year and if he has a strong off season workout program should add bulk to his frame. I don't think our depth is that bad with Davis, Curry, Lewis, etc. coming off the bench. Problem is if Boss has injury issues again, then the depth is suspect. I am concerned with Holmes given his age and the amount of playing time he has logged. If the Lions think Lehman is better suited to play the outside, then I hope they look to add another MLB this offseason. I'm more comfortable with who they have on the outside. Other than Holmes, our linebackers are very young. Bailey, Lehman and Lewis each only have one season under their belts. We also need to give this group time to develop. While I believe the Lions do need to address the linebacker situation, it is far from one of their more pressing needs at the moment. Carlos, I respect what you have to say but remember that we are talking about a very young group here. Other than Holmes, the remaining quintet have less than five years in the league. They will develop into a fine group soon. As for Baileys knee, his coming back for the season last year was a dream from the start. They left the door open in hopes he could recover quickly, but it didn't happen. When the doctors got into the knee they discovered there was more damage than they suspected. It wasn't as simple as they originally thought. I realize Boss has had previous knee problems, but it wasn't so much a case of his not healing fast enough as much as it was the Lions being overly optimistic on his chance of returning during the season. As for Lewis and Davis being undersized, the same thing can be said of Ray Lewis, Jon Vilma, Nick Barnett, London Fletcher, Tommy Polley.........the list goes on. The lesson is, don't judge the book by it's size. Lewis and Davis are solid backups and played pretty well in nickel and dime situations. What exactly has Davis done so poorly? IMO he has played better than Barret Green did, and he was a starter! You dismiss Holmes as a nothing above average. The man had over 130 tackles. That's pretty impressive for a guy playing two thirds of the time. Playing behind Shaun and Big Daddy helps, but you still have to make the plays. I think Holmes is better than you are willing to give him credit for, as are most of the linebackers. I realize the team is frustrating, but you can't deny the talent that is there. They just have to put the remaining pieces in place. chris speilman was a slow midget but he had a pretty decent career with the lions. First off I don't think Lehman is going to make it as MLB. He's just not good at taking on blockers at the point of attack. That said I also think Lewis and Davis are both best served as being reserves since neither seems to be that sure of a tackler. Starting Lehman at WLB and Bailey at SLB is the Lions best plan plus they would have excellent depth with Lewis, Davis and Curry behind them. MLB is another question Holmes could be fine for another year but a replacement needs to be found. Rainer can be the backup if somebody isn't drafted. I would honestly say LB position is pretty much set. Improvement at the position depends on the return of Bailey and Lehman moving. He's just not good at taking on blockers at the point of attack. That said I also think Lewis and Davis are both best served as being reserves since neither seems to be that sure of a tackler. All this talk about middle linebackers makes me miss stephen boyd. There was an old school MLB. 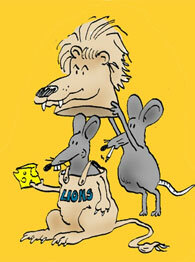 He could have been one of the best players in Lion's history if he didn't mess up his back. Oh man, he was one hell of a MLB. m2, you're right -- they should be judged in part based on their experience. so to say they will always be mediocre is unfair. neverthless, maybe as a group we need a fourth or fifth year player among the starters, someone young but experienced, to balance the unit. I can respect that Carlos. Some experience, even in a backup role, would be welcome within the linebacking corps. I wouldn't mind seeing the Lions re-signing Wali Rainer, as I feel he is a good special teams player and fills in admirably in the middle when Holmes needs a break. Seven linebackers is usually what the Lions carry on their 53 man roster anyways. They now have six under contract for 2005. I will say this, I would love to see the Lions make a run at Ed Hartwell from Baltimore. I think he's a very athletic linebacker, and would allow Holmes to assume a backup role in his last contract year. Hartwell would be an upgrade over Holmes, even as well as he played in 2004 for the Lions.